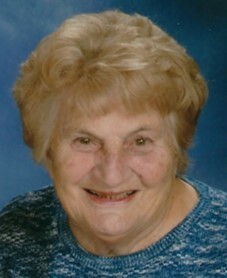 Joan Lee (Regney) Smolar, 89, of New Brighton, passed away Wednesday February 6, 2019 at the emergency room at Heritage Valley Beaver. Born November 8, 1929 in New Brighton a daughter of Ernest and Hilda (Fuller) Regney. She was a member of Holy Family Catholic Church of New Brighton and the Holy Family Christian Mothers. She also enjoyed her card clubs and soap operas. She was preceded in death by her husband of sixty years Emil Smolar in 2015 and one brother Ernest Regney. Surviving are her four children daughter Barbara (Butch Schlosser) Lohle, Patterson Twp., son Martin (Dorenda) Smolar, Barboursville, VA, son Mark (Mary) Smolar, New Brighton, daughter Diane (Richard) Moore, New Brighton, eleven grandchildren Douglas (Kirsten) Pletz, Jason (Emily) Pletz, Jamie (Bryan) Jordan, Colin Lohle, Martin (Julie) Smolar Jr., Brandon (Ashley) Smolar, Stephen Smolar, Nathan Smolar, Brandy Wyne Moore, Nicole E. (Randy) Moore and Danielle Jane Moore, eleven great grandchildren, Logan, Dylan, Norah, Jack, Sophia, Henry, Charlotte, Maxwell. Caleb, Noah and Destiny, one brother James (Sally) Regney, Center Twp., one half- brother Bobby Beaver, New Brighton, several nieces, nephews and their families. Friends will be received Monday from 3:00pm to 8:00pm in the J&J Spratt Funeral Home, 1612 Third Avenue, New Brighton, where prayer will be held Tuesday at 9:30am followed by Mass of Christian burial at 10:00am in the Holy Family Catholic Church, New Brighton. The family wishes to recognize and thank her grandson Stephen Smolar, who has been there with his grandmother the past few years. He faithfully remained by her side for comfort and care. Thanks Stephen.